The major difference between active and passive checks is that active checks are initiated and performed by Nagios, while passive checks are performed by external applications. Examples of asynchronous services that lend themselves to being monitored passively include SNMP traps and security alerts. You never know how many (if any) traps or alerts you'll receive in a given time frame, so it's not feasible to just monitor their status every few minutes. Passive checks are also used when configuring distributed or redundant monitoring installations. An external application checks the status of a host or service. 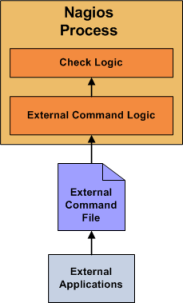 The external application writes the results of the check to the external command file. The next time Nagios reads the external command file it will place the results of all passive checks into a queue for later processing. The same queue that is used for storing results from active checks is also used to store the results from passive checks. Nagios will periodically execute a check result reaper event and scan the check result queue. Each service check result that is found in the queue is processed in the same manner - regardless of whether the check was active or passive. Nagios may send out notifications, log alerts, etc. depending on the check result information. The processing of active and passive check results is essentially identical. This allows for seamless integration of status information from external applications with Nagios. Set accept_passive_service_checks directive to 1. Set the passive_checks_enabled directive in your host and service definitions to 1. If you want to disable processing of passive checks on a global basis, set the accept_passive_service_checks directive to 0. If you would like to disable passive checks for just a few hosts or services, use the passive_checks_enabled directive in the host and/or service definitions to do so. External applications can submit passive service check results to Nagios by writing a PROCESS_SERVICE_CHECK_RESULT external command to the external command file. timestamp is the time in time_t format (seconds since the UNIX epoch) that the service check was perfomed (or submitted). Please note the single space after the right bracket. Note: A service must be defined in Nagios before you can submit passive check results for it! Nagios will ignore all check results for services that had not been configured before it was last (re)started. An example shell script of how to submit passive service check results to Nagios can be found in the documentation on volatile services. External applications can submit passive host check results to Nagios by writing a PROCESS_HOST_CHECK_RESULT external command to the external command file. timestamp is the time in time_t format (seconds since the UNIX epoch) that the host check was perfomed (or submitted). Please note the single space after the right bracket. Note: A host must be defined in Nagios before you can submit passive check results for it! Nagios will ignore all check results for hosts that had not been configured before it was last (re)started. Unlike with active host checks, Nagios does not (by default) attempt to determine whether or host is DOWN or UNREACHABLE with passive checks. Rather, Nagios takes the passive check result to be the actual state the host is in and doesn't try to determine the host's actual state using the reachability logic. This can cause problems if you are submitting passive checks from a remote host or you have a distributed monitoring setup where the parent/child host relationships are different. You can tell Nagios to translate DOWN/UNREACHABLE passive check result states to their "proper" state by using the translate_passive_host_checks variable. More information on how this works can be found here. Note: Passive host checks are normally treated as HARD states, unless the passive_host_checks_are_soft option is enabled. If an application that resides on the same host as Nagios is sending passive host or service check results, it can simply write the results directly to the external command file as outlined above. However, applications on remote hosts can't do this so easily. In order to allow remote hosts to send passive check results to the monitoring host, I've developed the NSCA addon. The NSCA addon consists of a daemon that runs on the Nagios hosts and a client that is executed from remote hosts. The daemon will listen for connections from remote clients, perform some basic validation on the results being submitted, and then write the check results directly into the external command file (as described above). More information on the NSCA addon can be found here.